JAKARTA, Indonesia, March 6, 2018 /PRNewswire/ -- KinerjaPay Corp., (OTCQB: KPAY), a digital payment and e-commerce platform, ("KinerjaPay" or the "Company") today announced its plan to launch new game called Floo. This game is a result of a partnership with Ace Legends Pte. Ltd ("ACE"), a Singapore-based game developer (see previous news on https://www.otcmarkets.com/stock/KPAY/news/Kinerjapay-to-Expand-its-Ecommerce-Platform-With-Launch-Of-Kinerjagames?id=167002). The game will be launched on March 12, 2018. Floo is a new generation of .io games. The story of the game follows a beautiful journey in the sea and be the biggest fish of them all. This fish adventure is a multi-player survival game where players compete against other players. 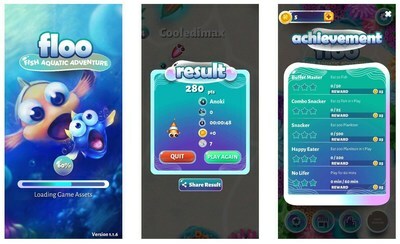 The game is simple; each player plays as a fish that was born among the coral reefs, using one finger to move and interact with the environment. The concept of the game and its objectives can be immediately understood by anyone. The Floo adventure builds an underwater world that is pleasing to the eye. Every aspect of this game, from the shape, coloring and movements are refreshing unique, and most importantly, fun. Floo was created to provide a new experience and challenge each time it is played, and the no-penalty concept enables play with no burden. Players are also able to mine KCoins and collect KPoint for use on the KinerjaPay platform. Edwin Ng, Chairman and CEO of KinerjaPay Corp., commented on the announcement, "We launched this game because we want the Company to be more than a business that provides a valuable solution to our customers, but one that also brings fun to our users. By creating interesting games, I believe we will also be able to introduce players to our traditional services. I anticipate that we will reach 45,000 new users with Floo, and this will be an important milestone for KinerjaPay as we continue to expand our brand recognition in the market."